10:14 a.m., Oct. 12, 2009----Fifteen University of Delaware students and two Lincoln University students who worked at the University of Delaware last summer presented posters at the 12th annual Undergraduate Research Symposium in the Chemical and Biological Sciences, held Oct.10 at the University of Maryland, Baltimore County. 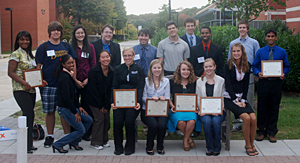 Eight of these students received first or second place awards in various judging categories. First place awards went to Tejal Naik in Biochemistry and Molecular Biology and to Katharine Shelly and Megan Kissig in the Biological Sciences. Second place awards went to Rachel Randell and Rachael Latshaw in the Biological Sciences; James White and Wachen Peters (Lincoln University) in the Chemical Sciences; and Steve Foltz in Biochemistry and Molecular Biology. Other students presenting or attending included: Jeneice Hamilton (Lincoln University), Michael Napolitano, Matthew King, Jean Huynh, Robert Sheehan, Rebecca Brown, Alissa Kregling, Wuroh Timbo and Scott Wroten. Brown, Foltz, King, Kissig, Latshaw, Naik, Napolitano, Randell, Sheehand, Shelly, Timbo and White are all in the University Honors Program. A symposium highlight was a plenary talk by Peter Agre, a Nobel Prize-winning chemist. He discussed the influences and unexpected events in his career that led from his undergraduate research experiences through medical school to his discovery of aquaporins, for which he received the 2003 Nobel Prize in Chemistry. Currently, he directs the Johns Hopkins Malaria Research Institute and serves as president of the American Association for the Advancement of Science. The Howard Hughes Medical Institute Undergraduate Science Education Program organized and sponsored the trip. Hal White, professor of chemistry and biochemistry and director of the HHMI Program, accompanied the students.